Pork pate served en croute at Harvest. Back in the day, everyone called it The Harvest — this was before the article dropped off and it became simply Harvest, no introduction necessary. And, once upon a time, I was a waiter there. I used to regularly serve Julia Child. To the frustration of the chef, she favored the burger. Her husband paid the bills and never left more than 10 percent. We were still happy for a brush with such a personality. Once, during a snowstorm, I served “lunch” to a certain illustrious Massachusetts governor and his guest — martinis followed by two bottles of wine. The waitstaff looked on in awe. When I once tried to pour Chateau Margaux into Meryl Streep’s Riedel, I missed and hit her hand. She smiled. I went shakily about my business. In those days, The Harvest was legend. An energy gripped the place. The cooks, the bartenders, the servers, the bussers, the baristas, the sommeliers, and of course the diners — everyone felt the charge, everyone was working on some kind of project in his or her spare time. The jingle we heard by night was not money, though there was plenty to go around. It was culture. As house organ of the neighborhood university, the Harvard Square spot offered up a cast of luminaries on any given night. Nobel laureate, celebrity novelist, local rock star, fabled opera singer, aging screen icon. They were a dime a dozen. Oddly, the Harvest of then surely looked more contemporary than today’s Harvest. It was an airy exercise in Scandinavian light backdropped with swaths of Marimekko fabric, which the Thompsons introduced to the US via Finland. In other words, design out of reach. Today, Harvest’s ceilings hover low, wood runs baronial, decorative touches smack of luxe seriousness. Yet the restaurant, tucked down an alleyway off Brattle Street, continues to buzz like a hive. It’s as if the conversation never stopped. Old professors continue to hold forth. Young academics argue vehemently, then explode with laughter. The Europeans still roll in late wearing black. And for the most part, the food at Harvest hits as squarely and creatively as ever. That sophisticated American style the Thompsons nosed out has assumed an impressive life of its own. If anything, the service is better: quietly, knowledgeably professional. Granted, the cocktail menu could be swapped with that at just about any other area restaurant. At $14 a pop, one hopes for concoctions that run deeper and more daring. Thankfully, the ambitious wine list is both those things. The pork pate is a tremendous start to dinner. 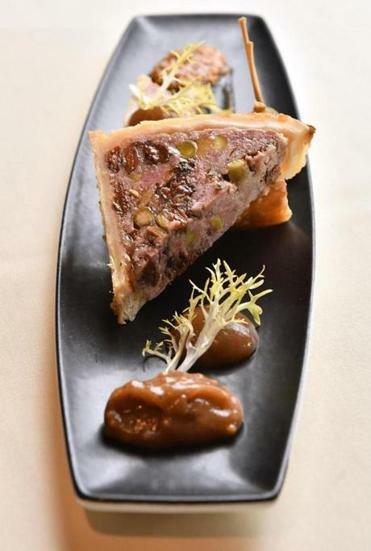 Served en croute, studded with pistachios and dried black cherries and draped with pear mostarda, it elaborates boldly on what had been a simple Harvest staple. Maine sea urchin at Harvest. For a lighter beginning, the Maine sea urchin offers a quintet of sweet discord. 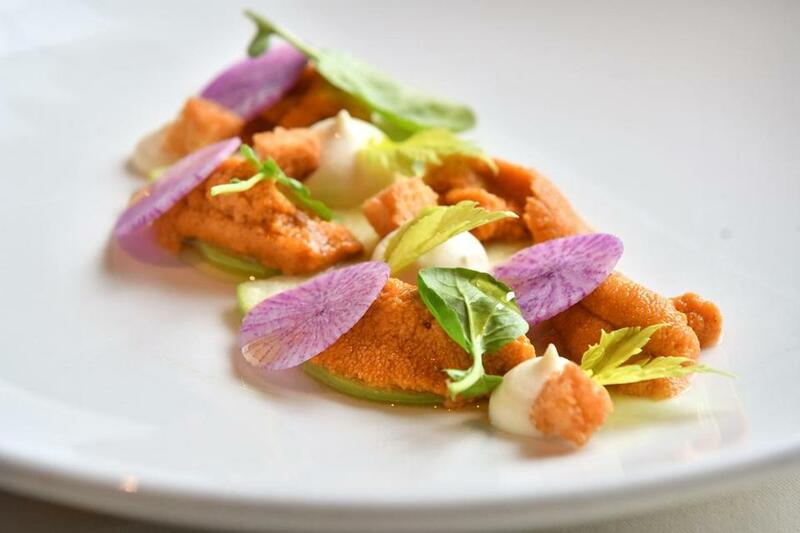 Lobes of uni see their funk checked then raised by weightier celery root and toasted brioche, brighter green apple and radish. Apple and fennel salad is beautiful enough to justify the price ($14) for mere apple and fennel. As with the sea urchin, texture and intensity are put subtly into play. I eat this before the garlic and fennel roasted porchetta — pork loin inside crisped pork belly, served with farro risotto and green chimichurri — which has to be one of the more satisfying one-two punches around. A few of the starters could use retooling. The beet salad sounds promising, yet the brie it’s layered with is tough, offering no creamy solace. Parsley rigatoni represents one half of a superb dish. Sure, the pasta is beguilingly green and toasted hazelnuts cast surprise depth and crunch, but it misses the simple bite of straight-up parsley. My mouth pines for it. Still, at most turns chef Tyler Kinnett upends expectations vividly. This accounts for one of Harvest’s finest dishes. What sounds weird — whole-wheat pappardelle with braised veal, toasted pepitas, and zhoug (a Middle Eastern condiment made with spicy green peppers, cilantro, and parsley) — tastes multidimensional and novel in the best sort of way. I could eat this pasta every week. Entrees follow the zigzag trail left by appetizers: wannabes laced with acts of transcendence. Risotto comes strewn generously with foraged mushrooms, braced with arugula pistou, yet slicked with olive oil and butter. The halibut, described as “brown butter poached,” turns out to be a honking fillet that feels like work to eat, and especially when fanned with undercooked pumpkin. Meat, however, is where everything comes alive. That porchetta is the definition of visceral pleasure. The venison — another echo from the Harvest of yore — can be glimpsed on just about every table. And with good reason. Served atop wine-braised cabbage, dolloped with sweet potato, traced with Concord grape jus, it is perfect for the cold season. 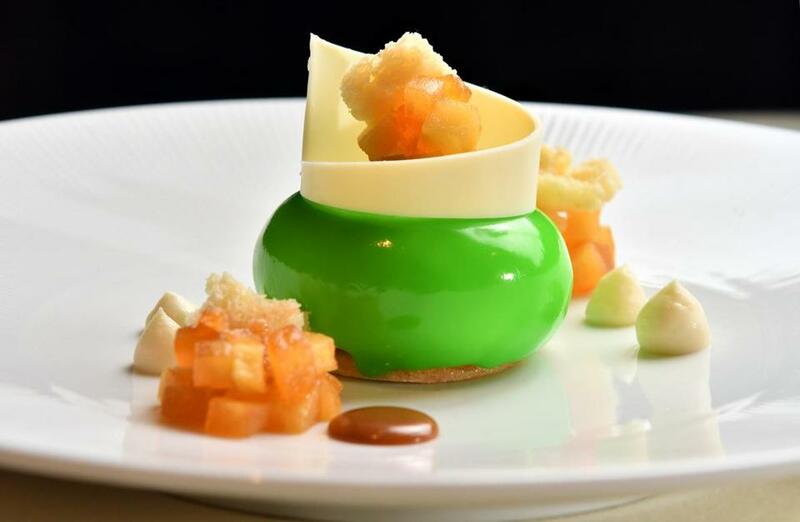 In a restaurant world that’s increasingly corporatized — Harvest is part of Himmel Hospitality Group, which also includes Grill 23 and Post 390 — this quirky play with sugar and cream and fruit feels like a Cambridge throwback. For a few moments, it allows you to shut your eyes and travel into the past. No cellphone, no Instagramming the meal, just a man and his apple. 44 Brattle St., Harvard Square, Cambridge, 617-868-2255, www.harvestcambridge.com. All major credit cards accepted. Wheelchair accessible. Prices Raw bar and first courses $12-$70. Entrees $26-$42. Desserts $8-$16. Hours Dinner Sun-Thu 5:30-10 p.m., Fri-Sat 5:30-11 p.m. Lunch Mon-Sat 11:30 a.m.-2 p.m. Brunch Sun 11:30 a.m.-2:30 p.m.